This brief eulogy was given by Kimm Connett at the Funeral of former Dulwich Hamlet player Rodney Brookes. I am standing here now as the Chairman of the Dulwich Hamlet Former Players Association which was set up officially in December last year. We had an inaugural event where around 50 former players were in attendance. Players who had played for the club in the 1950s, right up to those in the current day. And I am pleased to say Rod was there in attendance. Having played with Rod at Dulwich, as he was coming to the latter seasons of his distinguished career, I have very fond memories of the many car journeys we shared to and from training and to matches. And at that time it was under Alan Smith who was a very demanding and hard taskmaster. And it’s fair to say that we all, at some stage got the sharp end of his tongue lashings. Some more than most! Although at the time it was hard, It did bring together a fantastic team spirit and many happy memories of our time spent together. We talked a lot as you would expect about football on those journeys, and as a young lad having just left Charlton Athletic to join Dulwich Hamlet, it was fantastic for me to be able to listen to and draw down on such a wealth of wisdom and knowledge. Particularly how you should conduct yourself and constantly strive to better yourself as a player and as a person. Rod always led from the front and was a shining example to us all about how you should prepare and approach every training session and every game. He would never give anything less than 100% for the team and his teammates. On hearing the sad news of Rod’s passing, I received numerous email tributes and I would like to share a couple now to demonstrate the deep personal feelings that fellow teammates had for Rod. My initial thought is of sadness and shock, I met Rodney in 1975, an Adonis and a true leader. I was so pleased to see him at our reunion in December. As a younger player at the club he was a man I admired. A true legend. Rod was such a gentlemen and a great stalwart for the club. As a young man straight out of pro football, players of this calibre and experience in non-league took me under their wing and showed me what you needed to do to hopefully become a respected player in your team and in the league in general. I was lucky enough to play alongside Rod at full back in the odd games at first. When I eventually made it into the team I played at centre back alongside Rod. He was a giant in every way, and a gentleman on the field. I’ve never known him to go out and look to hurt anyone but he was as tough as old boots. In those days there were players at clubs who had reputations for hurting people. All teams had a big centre forward who would smash the centre halves around. Rod would come off with blood from a cut on his eye or nose, and then shake hands with the players as it was all part of the game. I would like to announce that an annual Golf challenge match between former players of the two famous clubs – Dulwich Hamlet and Sutton United – that Rod played for, will take place this October. We have mutually agreed that as a tribute, and out of respect for our friend and teammate we will compete for The Rod Brookes Memorial Trophy. Our grateful thanks to Kimm Connett for giving us permission to publish this piece in HH30. 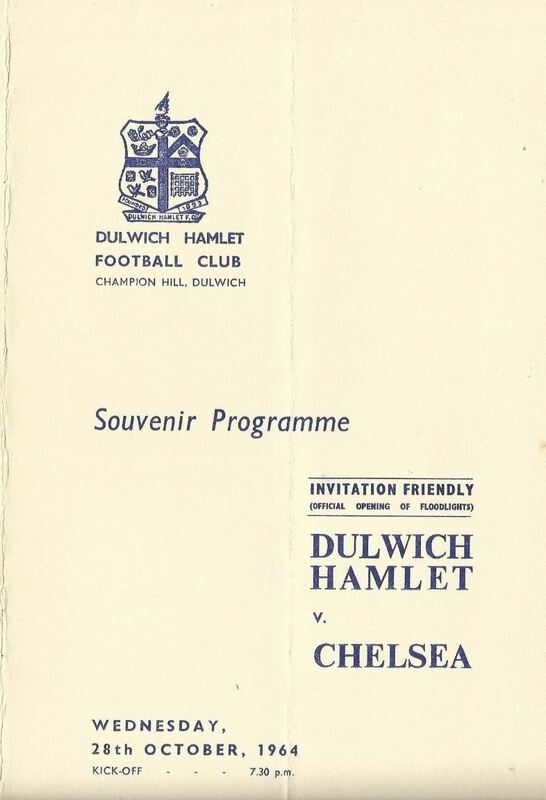 Chelsea and Dulwich Hamlet have had several encounters over the years. 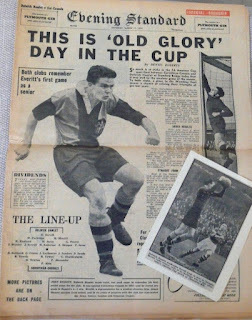 Prior to the first floodlit game in1964 the teams met in October 1929 in a London Challenge Cup* tie at Stamford Bridge. The Dulwich team from 35 years earlier included the legendary Edgar Kail, Jack Hugo, Cecil Murray, Alf Solly and Leslie Todd (who went on to become more famous as a Kent County cricketer). Chelsea did not underestimate the amateurs and again put out their first team which included three full internationals, and won 4-0. They finished the season runners up in Division 2 and were promoted alongside champions Blackpool. 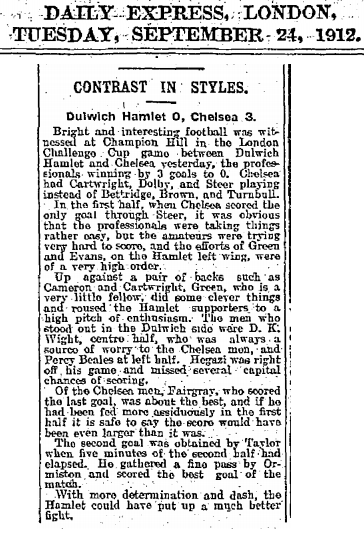 Dulwich were no strangers to Stamford Bridge, having played there the previous season (1928/29), when it was the venue for the semi-final of the FA Amateur Cup. Opponents Ilford booked their place in the final with a 4-1 win. On the way to the semi-final Dulwich put seven goals past Wycombe Wanderers in the third round and another seven past Aldershot Traction Company in the quarter final. Now fast-forward to March 1956, the same place and the same stage of the same competition. This time Dulwich were overcome by the Corinthian- Casuals. 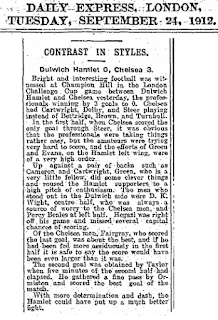 On the day, fifty coaches lined Dog Kennel Hill to ferry a few thousand Hamlet supporters to West London to boost the enormous crowd to 27,000. 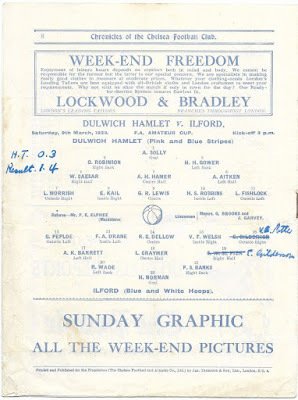 Despite the occasion, it wasn’t the greatest display by a Dulwich side, and they ended up losing by three goals to one, Ernie Skipper with the Dulwich goal. Corinthian-Casuals were defeated in the replayed Final by the northern giants Bishop Auckland. 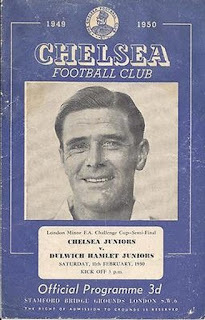 The Hamlet also contested for the 1949/50 London Charity Cup with Wimbledon at Stamford Bridge. Due to fixture congestion, this match was held over and actually took place in September of the following season. The Dons won 2-1. After the floodlights game it was another ten years before the clubs would meet again. In May 1974 another friendly was arranged as part of the deal that saw striker Alec Jackson move from Dulwich to the West London club. Peter Bonetti was still keeping goal for Chelsea, but this time it was he was who was on the wrong end of three goals. But unfortunately for the pink and blues Chelsea scored 7 (seven) at the other end. 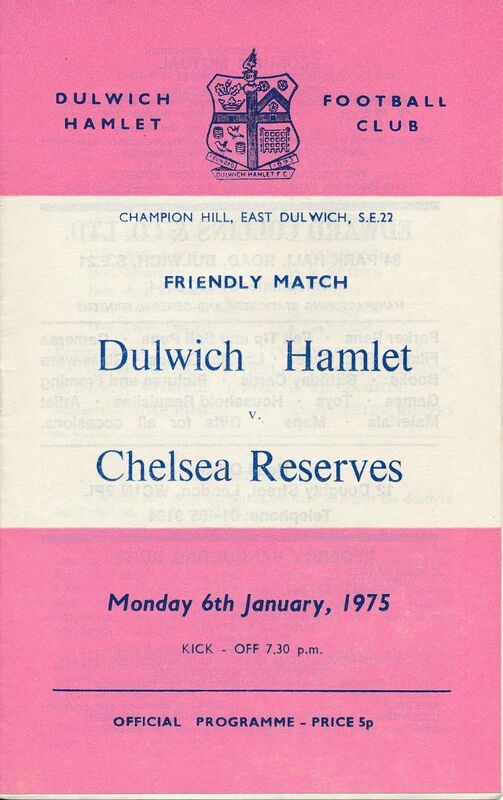 Only eight months later in January 1975, Chelsea returned, this time a second string, and defeated Dulwich 3-1. And in August 1977 – with Alan Smith now at the helm following relegation to the Isthmian League Division One – Dulwich lost 2-1. When the clubs next met, the tables were turned. Chelsea had been relegated from the First Division with a pitiful 20 points. Even if there were three points for a win back then they would have only amassed 35 points. And so, on Tuesday 14 August 1979, beneath those same pylons the Hamlet recorded a 2-2 draw with Chelsea. 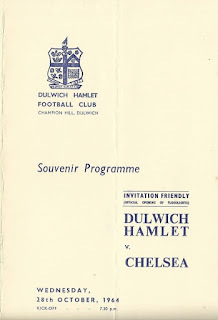 The last time the Hamlet entertained Chelsea was midway through the 1993/94 season, on 18 December 1993 at the present Champion Hill ground. It finished in a 2-2 draw. 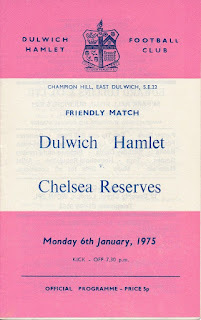 Jim Cannon’s Dulwich side were actually two nil up through Darren Brodrick and Francis Vines but Chelsea came back into it with two late goals. 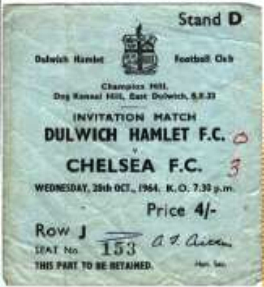 Two other matches to note: In the 1949/50 season (11 Feb 1950) Chelsea Juniors beat their Dulwich Hamlet counterparts in the semi-final of the London Minor Cup. Chelsea had already won the previous rounds 14-0, 13-0, 11-0 and a walkover. Dulwich were able to keep the score down to a respectable 2-0 loss. Chelsea went on to lift the trophy. The two teams met again the following year at the quarter final stage but this time the Hamlet saw success, winning 3-2. * The London Challenge Cup competition was discontinued in 2000. Oddly, the last two finals were contested by the same teams – Uxbridge and Dulwich Hamlet. The Hamlet won in 1999, but the final match was a 2-2 draw, but won on penalties by Uxbridge. Since writing this article we have come across an earlier meeting between the two clubs. This clip is from 1912/13 season. don’t suppose many of us give a moment’s thought to the floodlights at Dulwich Hamlet. As Summer turns into Autumn and Autumn into Winter they come on earlier and earlier on a Saturday afternoon. Midweek they are usually in operation from the kick-off. But for decades at Champion Hill, and every other football ground for that matter, there were no artificial illuminations flooding the pitch with light enabling fan and player alike to watch and play respectively. Instead, games started half an hour or forty five minutes earlier to utilise as much natural light as possible, and was usually played out in semi darkness. Rarely would a match be abandoned because no-one could actually see what was going on. Football matches staged under artificial lights date back to 1878 when two matches took place within a few weeks of each other, the first at Bramall Lane, Sheffield and the next at Kennington Oval. The newly invented electrical arc lamps were used, but the technology wasn’t fully reliable. Steam engines or huge batteries powering dynamo machines were never going to meet with the approval of the Football Association. However, by the 1930s lighting was of a much higher order, and in 1932 an experimental floodlit match was played at the White City Stadium in Shepherd’s Bush between two combined London teams. A white football was used to aid vision. It must have been a very muddy pitch because every time the ball went out of play a replacement was thrown on whilst the ball was washed clean. This happened on fifty seven occasions during the match! Again it did not take off with the stuffed shirts at the FA, and artificial light was banned in domestic competitive matches for a further two decades. y contrast, South American football teams were used to playing under such conditions. In a climate where ‘needs must’ cool evenings were the preferred game time rather than suffering the heat of the day. It was the rave reviews of returning touring sides like Liverpool, Arsenal and Southampton that prompted the FA to do a U-turn. When Arsenal played a friendly with Glasgow Rangers in October 1951, the Highbury floodlights attracted a crowd of 62,000 with gross receipts of more than £10,000. Cue cartoon like cash registers clinking away in the minds of the FA Council. That era saw the visit to these shores of some of the great European teams, many under lights. 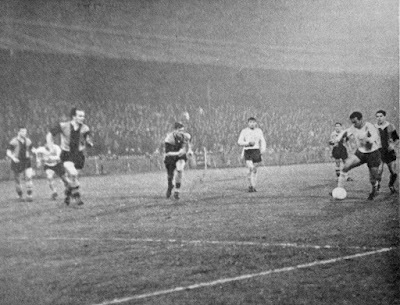 By 1956, floodlit League and Cup matches were sanctioned, as long as both clubs agreed. Eventually most professional clubs had installations fitted, and even the top Amateur clubs saw the light. 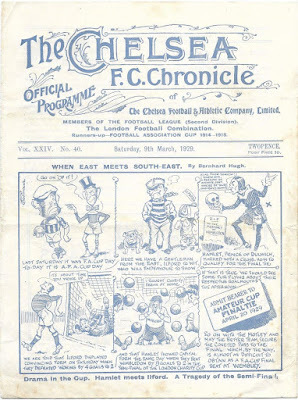 Like Dulwich, Chelsea prided itself in its Juniors making the move into the First team, so it is quite something that eight of Chelsea’s starting eleven came up through their youth system. 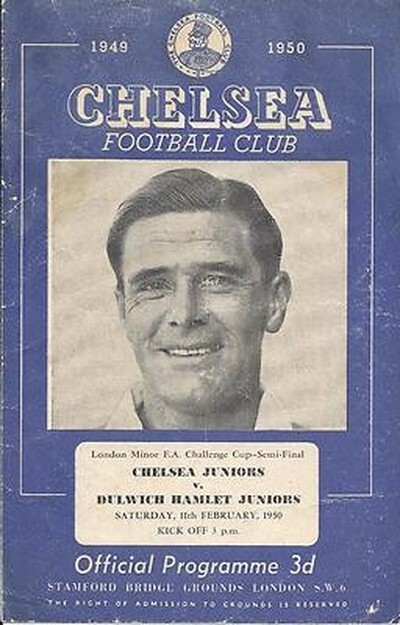 The Chelsea side was made up of household names such as Ron ‘Chopper’ Harris, Bobby Tambling, Barry Bridges, goalkeeper Peter ‘the Cat’ Bonetti and 18 year old captain Johnny Hollins. The visitors, in their away strip of bright yellow shirts and socks and blue shorts, took the lead midway through the first half through Bridges from a McCreadie free kick. Then on 39 minutes Murray made it 2-0. Dave Darvill in the home goal was kept busy throughout whilst the amateurs were given a real runaround by the professionals. Nevertheless, there were still several chances, and it was only due to a marvellous acrobatic save by Bonetti, just before the break, that Woolard’s powerful swerving shot did not reduce the lead. For the second half Chelsea fielded an entirely different eleven. This seems a bit harsh, the home side having to play another 45 minutes against a whole team of fresh legs, whilst they themselves did not even have a single substitute. Young volleyed a third on 69 minutes to kill the game off but the Hamlet showed great tenacity to the end, and were only thwarted from scoring by a superior defence. 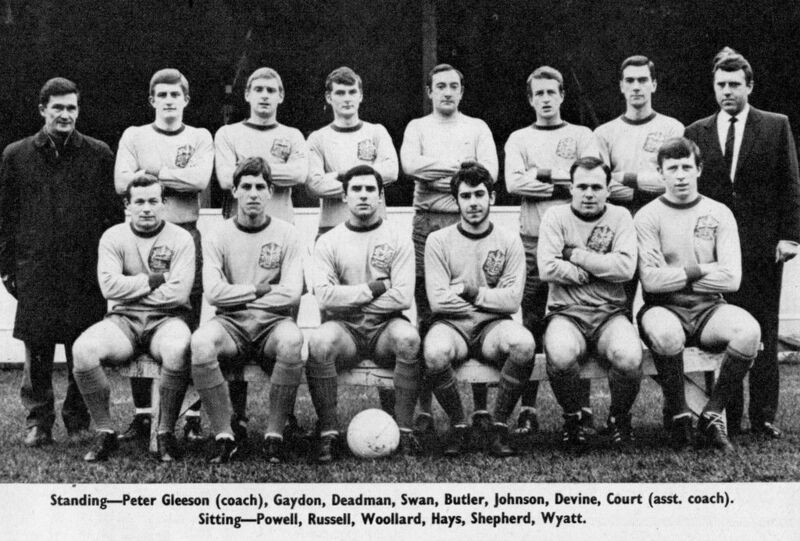 Chelsea’s subs included George Graham, Peter Houseman and Peter Osgood. Osgood, a member of England’s 1970 World Cup squad (along with teammate Bonetti), was still a couple of months away from his official Chelsea debut. Absentee, Terry Venables, missed the encounter, representing the Football League in Belfast. Chelsea finished the season as runners up to Leeds United. 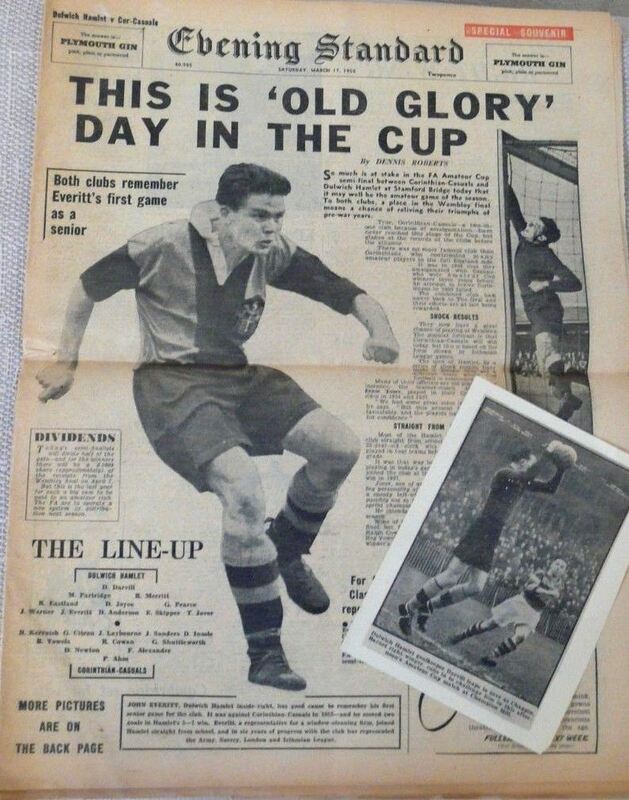 In the FA Cup they went out at the semi-final stage losing to eventual winners Liverpool, who beat Leeds in the final. However, they were successful in the League Cup Final defeating Leicester City by 3 goals to 2. By stark contrast Dulwich ended up in the bottom three for the second year running. And the next two years would only get worse. Dulwich Hamlet line-up: Dave Darvill, John Hammond, Reg Merritt, Mike Woollard, Denis Joyce, James Day, Roy Wootton, Steve Dunwoody, George Nash, Albert Modesto, Dave Le Grice. 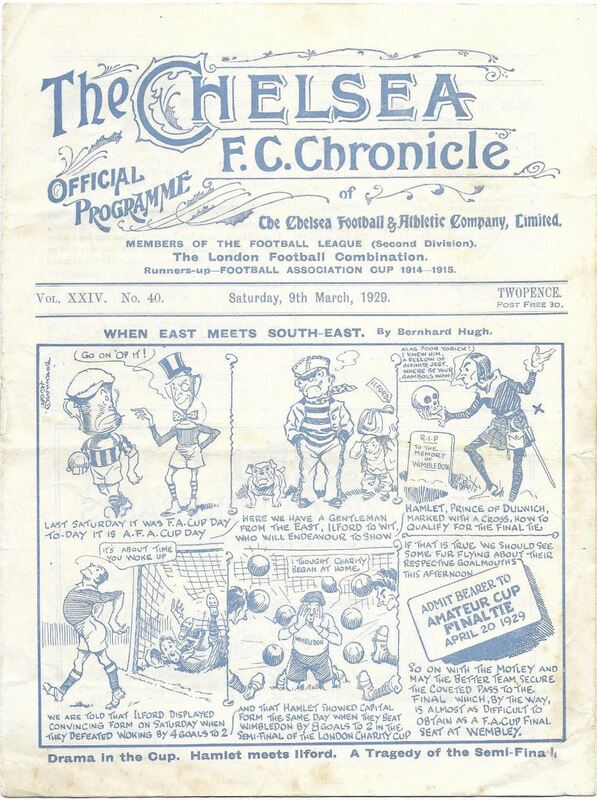 he general entrance fee for this prestigious friendly was adults paid two shillings (10p) and boys a shilling. For the wing stand or enclosure three shillings was charged, and for four shillings one could sit in relative luxury in the centre stand. Interestingly, right winger Roy Wootton, is a regular attender at most Dulwich Hamlet matches, both home and away, and often stands with the supporters behind the goal kicking every ball and encouraging the current team. The Ground Committee back in 1964 consisted of eight former Hamlet players: Arnold Botting (Club Chairman), Doug Waymouth (Deputy Chairman), Arthur Aitken (Secretary), Harry Brown (Treasurer), Bert Mew, Fred Dennis, George May and John Hall. It was the Committee’s desire to have top-grade floodlights installed, but they were governed by the financial commitment involved. The smaller crowds attending Champion Hill meant a much lower budget. Yet, despite the restrictions, the eventual improvements meant Champion Hill, already possessing some of the finest facilities in Amateur football, now had up-to-date floodlighting in line with many of its contemporaries and putting them on a par with the professional clubs. The floodlight installation comprised of four towers, 34 metres in height and made of tubular steel. They stood at the four corners of the ground, each one carrying twenty four 1500-watt lamps. Amenity lighting was fitted throughout the stands, and additional illumination along the driveway from the Dog Kennel Hill entrance to the ground, made a total of 150 kilowatts of lighting. Sources: Mike and Roy Wooton; Arthur Rowe, The Glare of Floodlight Football (1960); DHFC Handbook 1965/66. ike every young boy brought up in the fifties who played football in the street, the senior local amateur team was something of a pinnacle to aim for. So, when in 1960 after watching Kingstonian lose to Hendon 1-0 in the Amateur Cup Final at a full Wembley Stadium, (in which Alan Wyatt, Hugh Lindsay and Mike Candey featured and who later I would train and play with) I got a phone call to ask me to play for Kingstonian’s ‘A’ team at the age of 14. It was like winning the pools. The K's were one of the top sides at the time and their ground at Richmond Road had a wonderful playing surface and was used for Amateur Internationals. I had played on it as a schoolboy in the District side so knew the training area and clubhouse, which were excellent. It was then I met Vic Heasman, Alan Wyatt, Brian Wakefield, Brian O'Connell, Bob Butler, Dave Johnson, Tony Slade, Peter Searle, Dave Roberts, Roddy Hay and Bobby Russell – all of whom were to find their way to Dulwich Hamlet. I made my debut at 17 when Roddy Haider was selected for England. We played Hitchin Town and that was when Alan Wyatt became a mentor to me, offering sound advice like "Play the ball" and "Keep it simple." Advice which stayed with me all my playing days. I really enjoyed my years at the K's. It was a happy club and everybody was treated the same. It was at this time that Peter Gleeson managed to get me to Charlton Athletic where I played with Billy Bonds, Keith Peacock, Vic Halom and Ray Harford. My ‘claim to fame’ (which I have used in many after-dinner speeches) is that I have slept with ‘Bonzo’ in a double bed in Holland. We were on tour and played in Feyenoord Stadium against Spurs, and the home team in front of a huge crowd for a youth match. Bob Stokoe came in as manager and got rid of me and two other future Hamlet players – Ray Major and Alan Hawkins. Back to the K's and the bombshell that Peter Gleeson was leaving and going to Dulwich Hamlet. Why would he go there? That was the chat among the players as Dulwich were struggling at the bottom of the league. The consensus of opinion was that they could only get better. Dulwich were a sleeping giant with probably the best amateur ground in the country. A Scotsman took the reins at Richmond Road. His name was Tommy Dougall. He came from Hillingdon Borough in the Southern League. His introduction to the first team squad was on a tour to Spain. I don't think he was impressed with the behaviour of some of the senior players, who had quite a strong drinking culture. A few departures followed and he offered me expenses which were higher than what I had been getting. The catch was that he was an insurance salesman and half had to be used to buy an insurance policy! My father worked in insurance and told me to have nothing to do with it. I wasn't enjoying my football or the atmosphere created by Tommy so when Peter rang me and suggested I made the trip round the South Circular to Dulwich I jumped at the chance. My first game was an away game at Wealdstone, a team that included many amateur internationals and who were top of the league. We lost 4-2. Not a bad result as I had monitored some of the results before I joined and they were not very encouraging. After the first game I played I was invited into the boardroom to meet the committee. The chairman, Doug Waymouth introduced me to Harry Brown, Tommy Jover, John Hall, Pat Connett, Sid Gray and Arthur Aitken, who was holding his customary large scotch and called me by my surname all through the conversations. I was told that it was an honour to play for the club and that they would pay for my travelling expenses to matches. No brown envelopes here, I thought. When asked where I lived I said, Newcastle, which went down like a lead balloon. These men were true gents who were great servants of the club and all became good friends and advisers over my years at the club. Match days at the old Champion Hill were always special. I used to enjoy the commissionaire’s salute as he checked the badge on my car to allow me to park behind the main stand. One day the manager was stopped as he had changed his car and had no badge, Peter Smith who was walking in, was asked if he knew the man in the car. Peter said that he had never seen the man before in his life! Peter Gleeson was a bit late getting in the dressing room, and I think Peter Smith was sub that day. After parking up you were met at the main gate by Reg Mitchell who wished you luck and asked if you wanted any complimentary tickets. After dumping your bag in the dressing room, and negotiating the groundsman Len Evans’ Alsatian, we checked out the playing surface. The pitch was always a problem and usually had no grass on it from November on. The mud was rolled flat before every game. The first team used to watch Harry Brown and Tommy Jover (long retired) training on the pitch before the game. Tommy was still faster than some of the lads who were playing! And then we were greeted by a shout from Bronco in his white hat behind the goal. He would tell Alan Wyatt to aim for his hat when shooting. It must have worked for Alan as he scored around 30 goals in the 1967/68 season. When the game was over, after a plunge in the deep bath, it was up to the bar for the celebration or inquest with the committee and supporters. Our physio at the time was a Welshman called Emrys Tucker. He was partially sighted as he had been wounded in the war. The only way he could focus was to wear his flat cap at an angle. A visit to his surgery when injured was always a hilarious experience as his methods were quite basic. To become a committee man you had to be an ex-player. A tradition which created an atmosphere of togetherness with the existing players. This is obviously not possible in today’s game as commercial considerations have to be taken into account. Expectations and standards are different. John Hall was one of the committee I got on very well with. He was a large man. His party piece was his Tommy Cooper impressions, which he performed wearing a fez. He resembled the great comedian and his performances on tour still make me chuckle when I recall them. On tour in Majorca one year we stayed in the hotel next to where Liverpool F.C. players were staying. After talking to some of their players on the beach we were invited to join them in a club for a drink in the evening. To get in we had to say we were Liverpool players. The club was crammed with young women as George Best was on the island and they were looking for him. During the evening the manager of the nightclub approached Roger Hunt and Ron Yeats and asked them how many players Liverpool had with them as there were 54 in the club. None of them had paid to get in. We disappeared into the crowd. Gradually Peter Gleeson attracted players and we climbed the league and had some good results in the cups. Trips to Sharpness in the West Country in the Amateur Cup come to mind [DH won 2-1, Swan and Wyatt with the goals], and a Surrey Senior Cup Final which we lost 1-0 to Sutton United in a replay. 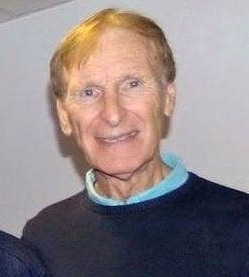 Trevor Blaydon scored the winner and he later played for the Hamlet. The club started the tradition of touring again. We went to Belgium, Spain and the Isle of Wight (where we played Harlow Town, which was a bit strange at the time). After some fixtures on a Saturday we visited the hotel in New Romney which was owned by O.C.S., who were now helping with the costs of the upkeep of Champion Hill. One weekend we were flown out to play a Jersey F.A. X1, but our performance was hampered by a night out in St. Helier before the game. All of these trips brought the players and the committee close together and created a good team spirit. This was probably the happiest time I have spent in football. Training during this time took place on the back pitch behind the main terracing. We spent many a session running up the terraces being shouted at by Tommy Court. He was a hard taskmaster with a wicked sense of humour. After a dip in the plunge bath in the old training clubhouse it was off to the Crown and Greyhound for a pint or two. I do think modern players have missed out not having a plunge bath to soak in after a game. Most dressing rooms in the Isthmian League had them. One pre-season we played an Arsenal Xl. The man of the match was a 15 year old, who looked about 11. It was Liam Brady. He strolled through the game, using his cultured left foot to split our defence with inch-perfect passes. 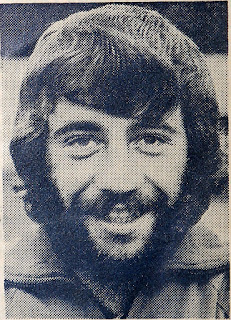 Our left back that day was Bobby Russell, a very talented 20 year old, who had the ability to overlap and cross accurately. He did not look out of place against the professionals of Arsenal. Luke Shaw reminds me of Bobby. Ironically he suffered the same injury – breaking his leg badly. It happened in a mid-week match at Wealdstone. This was a real tragedy for Bobby and his family as his father confided that Arsenal had asked him to go training with them. Treatment in the 60’s was not as good as it is now and Bobby never played again. At the end of the season it became apparent that Peter Gleeson felt that he had taken the club as far as he could with the financial restraints he was under. He resigned. It was all change at the Hamlet. A few players jumped ship before the new manager Fred Setters arrived. He came from Merstham, so it was quite a jump up for him. Managing in the pre-contract days was all about having contacts with players and Fred struggled in this regard. Results suffered. A few stayed including Peter Smith, Dave Barker and Vic Heasman, but it was a poor season. Paddy Long joined us, but he was at the end of his career. I had an offer to join Leatherhead but I had just met my future wife, who taught in East Dulwich. Her flatmate later married Dave Barker, so it suited me to stay. We have kept in touch with the Barkers and have spent holidays together. At the end of Fred's time we arrived for pre-season training to be told by Jimmy Rose that we were no longer wanted. The club had obviously taken the cash injection offered so they could attract better players. The amateur days were over and players were now placed on contracts. A month into the new season I received a phone call from Jim Philips (who was running the Reserves) and he asked Dave Barker and me to come back. We played with a group of young players – Steve Rogers, Alex MacFarlane, Charlie Pooley, Alec Jackson – and were quite successful. My appearances in the first team were more limited and after getting married and moving to live in Richmond, I found the travelling and commitment too much. I decided to call it a day. My friends Peter Smith and Dave Barker stayed and played in one of the most successful periods of the club’s post war history. John Barnes, a former 2nd team manager at Dulwich had become manager of the Lensbury Club at Teddington. Owned by Shell and playing in the Southern Amateur League, the facilities were second to none. When John asked me to join I jumped at the chance. Over the following years a veterans’ team was formed and former Dulwich players such as Eric Allison, Dave Barker, Vic Heasman and Ray Purvis joined. The likes of Hugh Lindsay, Ada Hill, Ian MacLean and Joe Fascione have all played and toured with Lensbury. I am still connected with Lensbury – now called Weirside Rangers – we run 4 teams every weekend and play at Imber Court. My time at the Hamlet, however, was the best time ever, and the club will always have a special place in my heart. The funeral of former Dulwich Hamlet player Hughie Wilson took place in Ayr, Scotland today. 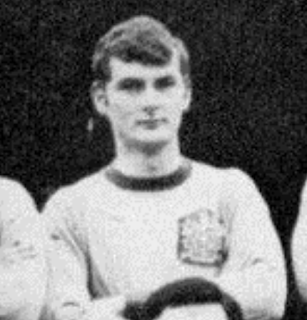 “Hughie played for Dulwich during the Jimmy Rose era. He was a teacher in Maidstone for many years after his playing career finished. A few years ago he decided to pursue a teaching career overseas and worked in some pretty far flung places like Bangladesh. Whenever he returned to the UK he would always come back to Maidstone and meet up with his many friends in the locality and then head to Scotland to visit his brothers and sister. Two years ago his health started to deteriorate and he was forced to give up work and returned to his native Scotland to stay with his family. Hughie was a great character and a very popular person. He often spoke about his times at Dulwich Hamlet, and playing with guys like Eric Allinson and Fred Pudney. of the rabble of diehards that have assembled behind the goal over the years one of the most eccentric was a senior citizen who always wore a white cap and a trench coat and possessed a foghorn of a voice. This was utilised for constant verbal abuse of the referee, and on occasion some very bad behaviour. The old man could easily strike fear into any would-be-mugger as he returned home from the game in the dark through the streets of London wielding his unfurled brolly. But this was way back in the eighties, and on the one hand I regarded him as quite a sad character and yet on the other, quite an amusing one. Still, I tended to give him a bit of a wide berth. And then he disappeared from the scene. But he was always fondly remembered and almost immortalised by fans and clubmen alike. And then about ten years down the line, by a remarkable coincidence I met Bronco in a nursing home in Barry Road. I had never spoken to him before but when introduced he greeted me with a hearty handshake. He had even read a copy of my 1919/20 booklet! I spent an hour or so with him and asked if I could come back on another occasion. “Of course.” I later discovered that like many old people he can be very moody. Catch him on a good day and you were in for a treat – he would happily recall his past experiences and Dulwich Hamlet’s glory days. Catch him on a bad day, however, and you were coldly welcomed by a cantankerous old man and sent on your way. I also discovered that his memory (regarding his own deeds and misdeeds) was somewhat faulty. orn 111 years ago in September 1905 ‘Bronco’ Munro was raised at 140 Rosemary Road, Peckham, round the back of Samuel Jones & Co. with its huge Camberwell Beauty butterfly mosaic in Southampton Way. He spent his schooldays at Oliver Goldsmiths – Snotty Oliver's, as his mother called it. A woman with a sense of humour, she gave her son the strikingly odd name of Lyhoneal, pronounced Lionel. Boy Named Sue mentality perhaps, but it certainly turned young Lyhoneal into a tough character, one that you wouldn’t mess with in a hurry. His father wasn't much use – a complete drunkard. Bronco claimed this put him off drink altogether, and he remained a teetotaller all his life. On leaving school at 14 he went to work for a while at the Peak Freens biscuit factory in Bermondsey. 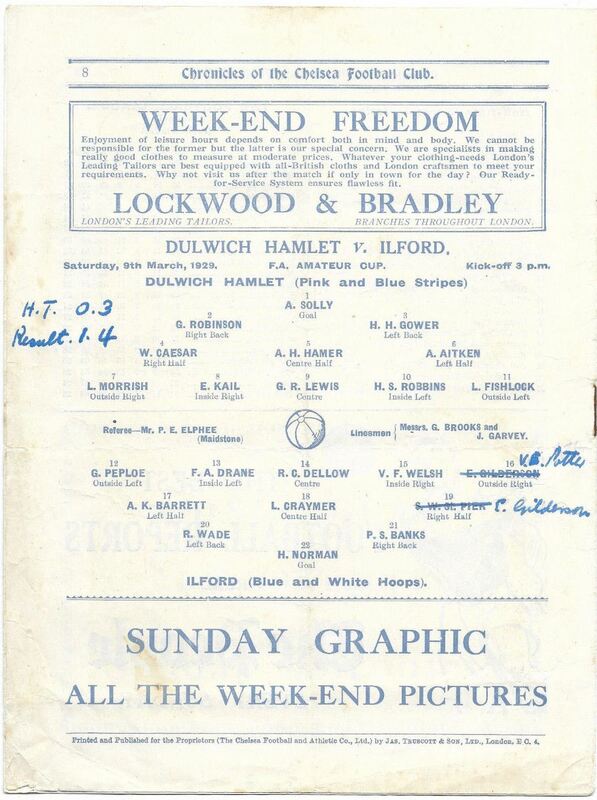 This was directly after the First World War and around the time Bronco began his love affair with Dulwich Hamlet. He witnessed the greatest days in the club’s history – the inter-war period – and attended the last three of the Hamlet’s four successful Amateur Cup Finals. He described himself as a “glutton for football.” Dulwich Hamlet being the main course. He faithfully followed the Hamlet travelling on foot to most away matches – Ilford, Leyton, Wimbledon and the like. On the odd occasion he would get the coach back, yet he actually preferred to walk. Bronco eventually settled into a job as a bookie’s runner, working for the same boss for 37 years. He was often seen bare chested in summer months, wearing his trademark white cap, marching through the borough of Camberwell, collecting bets in the streets and dodging the local bobbies. He supplemented his income with some professional boxing matches. I offered Bronco an old photograph circa 1900 of some children walking down Southampton Way where he grew up. He studied it for a while and I suggested pinning it on his wall. “What do I want it for? It's no good to me, you keep it.” He sat in his easy chair, only a television for company. “You don't need to go out tonight,” he told me. “Newcastle are playing in Europe. You must watch it. BBC1 seven o'clock.” He repeated the time and channel over and over just in case I didn't hear, before raving about Newcastle’s skilful Columbian, Faustino Asprilla. At 91 years old and housebound, Bronco Munro continued his gluttony for the beautiful game that is football. I never saw Bronco again after that, but the final whistle did not blow on his life until he reached the grand old age of 100. © Original article from HH30 Winter 2016. Adapted from ‘The Horse’s Mouth’ article from Champion Hill Street Blues 52, May 1997. We hope to have issue number 30 of the Hamlet Historian magazine on sale on Saturday 17 December 2016. 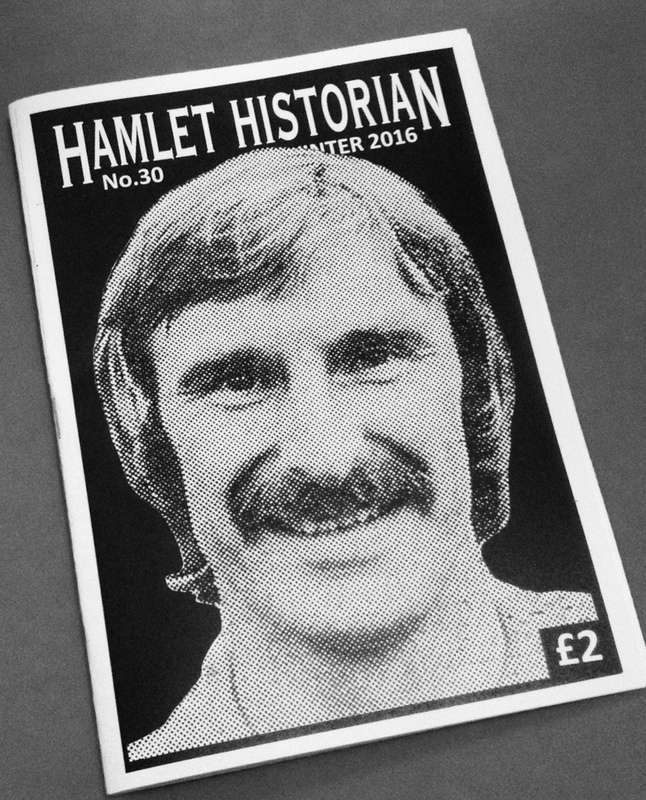 Three former players – John Swan, Kimm Connett and Roy Wooton – have kindly supplied us with material for this 40 page issue, which features articles relating to Dulwich Hamlet in the 1950s, 60s and 70s. A portrait of the late Rod Brookes adorns the cover. Hamlet fan James Knight reviews the Terry Morris book, In a Class of Their Own, and Mishi Morath of the Football Committee continues his series on the 1977/78 season. Priced at only £2 and for sale before and after the game with Tonbridge Angels and during half time interval. "A piece of ground in Woodwarde Road was secured and practice games were held before the start of the season. The ground was very small and uneven and in wet weather covered with large pools of water, which frequently were frozen, so whenever possible a pitch was obtained in Dulwich Park. 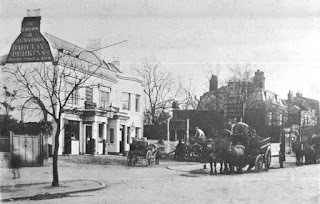 There was no accommodation for changing on the Woodwarde Road ground and so the Reading Room in Dulwich Village was used. The goal posts and flags were carried from there through the village and The Crown gardens to the ground. 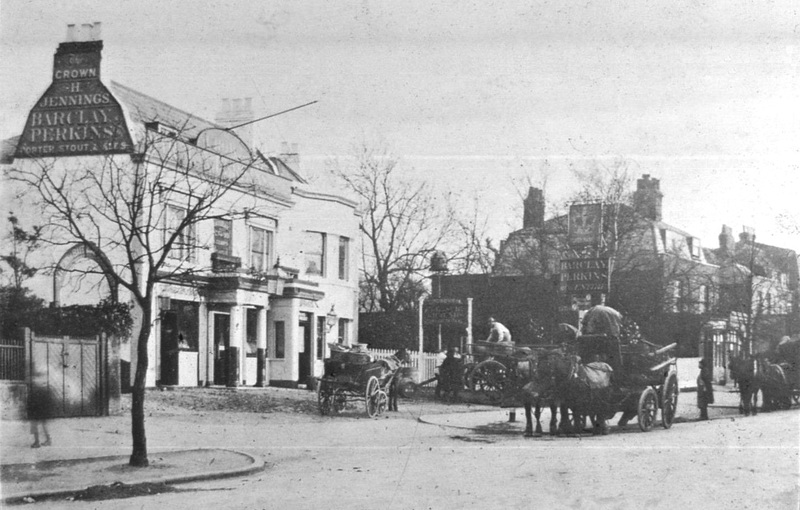 It is interesting to note that there were two Inns, The Crown on the site of the present Crown and Greyhound and the Greyhound on the other side of the road."